Opening an adult day care center is a worthwhile pursuit, as owners help family members of disabled or aging relatives meet their obligations. Overall, adult day care leads to a more balanced life for everyone involved. Due to the aging population, this is a growing industry and there has been a 35-percent increase in facilities since 2002, with over 260,000 participants served. The cost for Adult Day Care Services are rising too. According to the blog INSURANCEFORNONPROFIT.NET New York leads the way at an average cost per month of $1,950 a month; New Jersey is second at an average cost of $1,842.00. Still, there are shortages in the industry and, in fact, 29 percent of current adult day care facilities have waiting lists. Overall there is a lot of urgency for these businesses, but entrepreneurs should review vital criteria to do things properly, protect themselves and their businesses, managing risks properly to keep unnecessary costs low. Though customer base in adult day care are diverse, with differences in ages and abilities, the typical participant is 65 or older. They frequently suffer from dementia or a physical disability that require constant care or assistance with activities of daily living (ADL) which puts pressure on the Adult Day Care staff. Because this is a thriving industry and communities need these services, there are many excellent resources available, and these include grants for startup funds and both state-level organizations and National Adult Day Services Association (NADSA). State leaders can provide a lot of detailed information about rules and regulations for each specific state, and NADSA offers mentoring and networking opportunities and a library of useful information as well as a community listserv and discounts for products needed for the business. 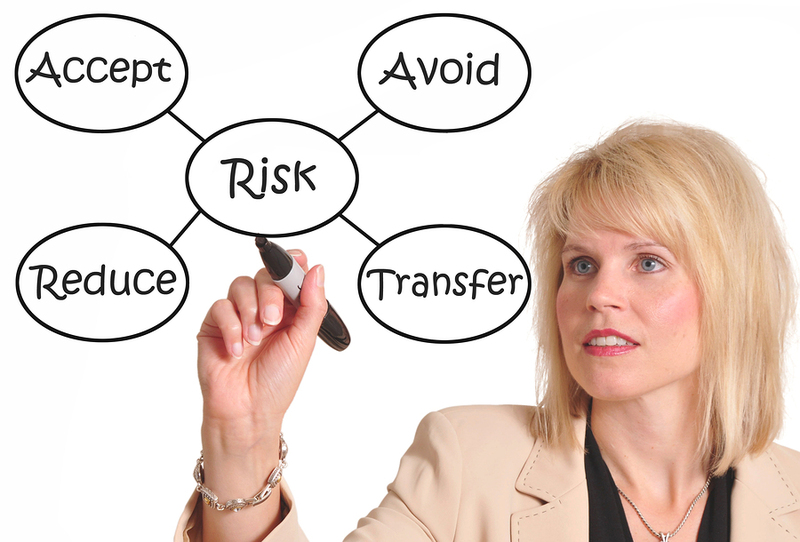 As the business grows and employees are added, having an expert risk management professional to discuss business insurance needs and workmen’s compensation challenges will focus the business on containing costs and using the right resources to help them grow the business while controlling the risk related costs that ultimately rise is such a risk laden industry. Though starting an adult day care facility is not a simple task, it can be a very satisfying one as lives are changed for the better due to the services provided. Further, keeping an adult day care center profitable has its challenges, but taking advantage of the many resources available to adult day care center owners can make the difference between success and failure. Additionally, assessing and addressing risks in advance with someone knowledgeable and committed to the business’s success guides the business to success as well. Due to the high labor component in the Adult Day Care space employee injuries can really drive costs. Unexpected worker’s compensation claims can be an extremely expensive lesson for a business owner not prepared for or anticipating it. According to John Hague at Metropolitan Risk, “ time spent on the up front training, educating and monitoring new and existing employees through a tight HR process can lower the cost of the inevitable employee injuries by up to 40%.” Speaking with a Risk Advisor specializing in adult day care facilities will yield substantial future dividends. They can offer real solutions for adult day care workmen’s compensation, general liability or commercial auto insurance as well as other risk challenges . Don’t simply buy insurance. Focusing on risk management practices should be on the owner’s checklist of vital tasks to handle before the very first participant enters the adult day care center. More questions? Reach John at (914) 357-8456 or CLICK HERE. Today information is both free and ubiquitous. I was curious about the cost of Adult Day Care in the various states in the New York Metropolitan Region. 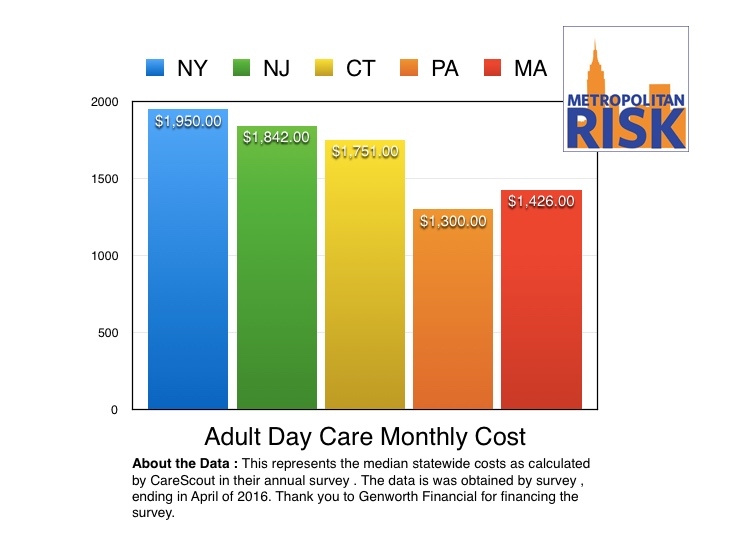 Big shout out to Genworth Financial and Care Scout for doing the heavy lifting in terms of figuring out the cost of adult day care in Metropolitan NY region. I was curious because we see huge differences in both the services provided and the insurances needed to properly run an Adult Day Care business. Take New Jersey for example. New Jersey’s Adult Day programs tend to be pretty sophisticated facilities in terms of the level of care and medical services provided. They tend to be staffed with more registered nurses than are certain Adult Day businesses in New York which are operated more as social clubs. Where your Adult Day Care business is located is probably one of the largest determinants of cost. Primarily because their costs rise and fall contingent on their location. Both Labor and Real Estate costs are significantly higher the closer you get to New York City; Long Island and Northern New Jersey is no bargain either. It’s not just the real estate and labor that drives costs. Workers compensation insurance for adult day care business are much higher in downstate NY than they are in upstate NY. It’s not just the rates but the ultimate compensation employees are paid down state result in higher workers compensation costs due to the increased payroll. Further when they suffer employee injuries the surcharges on the workers compensation premiums as applied by the experience modification factor for Adult Day Care increase exponentially. I am sure the reimbursements from the state don’t come close to reconciling this imbalance. This is why it’s imperative that Adult Day Care operators remain vigilant when it comes to their unit cost structure when delivering their service. Insurance costs for Adult Day Care business’s should be an area of focus. Especially as worker compensation insurance for Adult Day Care business’s and commercial auto insurance if they are providing transportation. We suggest partnering with an insurance broker that has resources to assist your growing Adult Day Care business so your education doesn’t become expensive. Not sure where to turn? We suggest you speak to a Risk Advisor. A staff member arrives at your door, panicked; someone has been injured in your facility, now what? If you’re an average non profit or school you simply pick up the phone and call EMS and wait. Once the dust settles you sit back in your chair and call your insurance broker who transfers you to a claims admin person in their office to take down basic information. A week later you get a call from a company adjuster who asks the same information. You hang up and try and forget the whole experience only to be reminded upon your liability insurance renewal, or your workers compensation renewal, that your insurance premiums have doubled as a result of that claim. Sound familiar? We believe the best approach to claims is the dual philosophy of being prepared AND following up. These two approaches are not mutually exclusive but work in tandem to deliver substantive results to any for profit or not for profit organization. This article deals with the first principle “Be Prepared”. Understand that improvement to your insurance claims practices drives both cost efficiency and cost consistency. Our clients understand the price they pay on insurance is a direct function of how well they manage their claims, period. This is why we coach our clients to our specific claims protocol. The Scouts of America had it right, be prepared. Any top flight organization has an emergency procedure action plan if certain events present themselves. They know that when they are “IN” a situation, panic, uncertainty, and hasty decisions result in a suspect outcome. That is why we advocate during a claim event that a very specific claims form tailored to your business model and your organization be drafted, thoughtfully and un-emotionally which will help organize your approach to this event. Capturing little details such as what the weather conditions were like, potential witness statements, photographs, contributing physical evidence like a broken chair, or floor obstacle, can immediately make a HUGE difference in helping craft a defense for your Non Profit Insurance Company and your organization that will ultimately save you much in the way of blood and treasure. If you’re a Nursery School, Private School, Charter School, Non Profit Organization, Adult Day Care or Home Health Care Business that operates a facility, we suggest you download our Free Claims Report Tool that was developed specifically for school based organizations that cater to children, students, and teachers. Being prepared, building your defense file IMMEDIATELY with all the little details will pay huge long term dividends. Do what you have always done and get what you have always gotten.